He was already taken to the firing squad for execution. His family, living 2,000 miles away, had started mourning over his death. 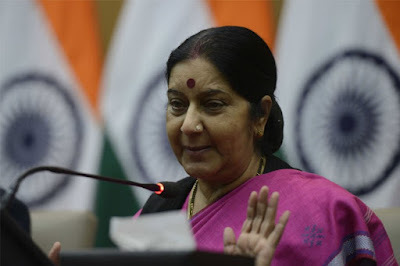 Possibly because of the Indian External Affairs Minister Sushma Swaraj's diplomacy and negotiation, Gurdip Singh was reprieved at the last minute from the execution on Thursday in Indonesia. phone call on Friday morning saying that Gurdip has been spared from execution. About to be executed Gurdip was to be executed in Indonesia on charges of Heroin smuggling at 10 pm (IST) on Thursday night. would be executed later. Reports suggest that Gurdip had personally called his family later on Friday morning and profusely thanked the Indian Government and media for taking his case seriously. External Affairs Minister Sushma Swaraj acknowledged the development and said: "Indian Ambassador in Indonesia has informed me that Gurdip Singh whose execution was fixed for last night, has not been executed." Arrested for trafficking Gurdip Singh was arrested on August 29, 2004, at the Soekarno- Hatta Airport on charges of drug trafficking. He was found guilty by an Indonesian court for trying to smuggle in 300 g of heroin and was handed a death penalty in 2005. The prosecutor in the court claimed that he was duped by an agent into paying for what he believed was a work visa in New Zealand and was allegedly abandoned mid-journey in Indonesia. He received death sentence at a lower court which was upheld by the Supreme Court of Indonesia. He is presently detained at Nusakambangan Pasir Putih, Cilacap.